And today obviously all the predominant narratives — the old liberal-left welfare state narrative; the post-modern third-way left narrative; the neo-conservative narrative; and of course the old standard Marxist narrative — they don't work. Where are we? Where are we going? Can we imagine a popular mobilization outside democracy? Join fellow downtown commuters to kickoff Downtown: On the Go! The City of Tacoma, Pierce Transit, UWT, and the Tacoma-Pierce County Chamber of Commerce are working together to reduce congestion and parking challenges in downtown Tacoma by helping commuters get into buses and vanpools, out walking, biking, and sharing rides! Enjoy lunch from the Harmon and Hub restaurants, and receive $1 off just for stopping by! Sign up for PierceTrips.com and enter to win great prizes from some of your favorite downtown merchants. Listen to the music of the Joe Baque Trio. Sip coffee or tea from Blackwater Café and Mad Hat Tea Company. Win great prizes, including free bus passes! Find out how businesses encourage commute options – and how you can get involved. Explore a Pierce Transit bus, Bus Plus, and Vanpool. Get tips for riding transit, and chat with a regular vanpool commuter. Check out a Scoot Car and find out how you can receive a buy-one, get-one free coupon from Hello, Cupcake. See the Downtown Plan and visit with planners from VIA Architects. Pick up the brand new downtown walking map. See also the sponsor post. Chalk Challenge No. 25 is made possible through charitable donation of intimidating POWER LUNCH with TACOMA ARTS LIST SERVE CZAR: AMY McBRIDE! Top 3 results-oriented chalk artists will share a meal with one of Tacoma's most powerful civic arts administrators at The Matador Embalmed Beef Eatery. YOUR OPINIONS WILL BE DIGESTED INTO VALUABLE COMMUNITY arts FEEDBACK! by KevinFreitas on 9/26/2008 @ 9:09am I'll definitely be there today. Get the good weather while you can everybody and join in! by NineInchNachos on 9/26/2008 @ 9:44am get pumped ! by joel413 on 9/26/2008 @ 10:36am This is getting to become an addicting habit. I should be there today! 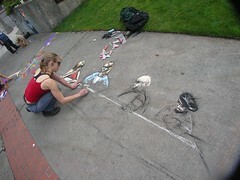 by Erik on 9/26/2008 @ 11:03am Nice cool and dry chalking conditions at Frost Park today. The ghosts of a few other submissions remain which should mix it up a bit. Its will be interesting to see who gets first, second and third place to determine the luncheon seating positions with Amy McBride. by KevinFreitas on 9/26/2008 @ 11:19am Confirmed: Stowe will is en route from his vacation and will be bringing some out-of-towners. It's *so* on now! by Erik on 9/26/2008 @ 11:51am Confirmed: Stowe will is en route from his vacation and will be bringing some out-of-towners. It's *so* on now! We will see if the Frost Park chalkie regulars can hold their against Stowe's (zombie?) artist horde. by joel413 on 9/26/2008 @ 2:26pm I had a lot of fun today.. only 5 chalkies. But somuch there in those 5 pieces. If Electric Elliott's contains a self portrait and if you say the cats in RR's are Garfield, then every piece today contains an homage to a chalkie. But the real question is can we decipher the Lupid Code? Fact: Each diner is either wearing eyewear, or their eyes are shadded. Fact: Andrea has her hand raised to her mouth in thought. Code: Or is she picking her nose? Biting her nails? Sniffing her finger.... What does it mean? Fact: RR's arms are crossed while everyone else has open orms on the table before them. Fact: The limes of the Corona's are still protrding from the necks, and have not been submerged in the beer. Fact: The table cloth is white. Code: Does this express the innocence of Tacoma Art and the fact that is has yet to be forever stained by PRANG? Why has RR spent $700B to store a Clone Army at Tacoma SELF Storage? 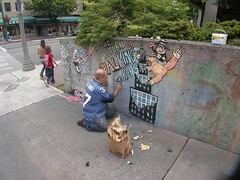 Why is CHALKing Kong climbing on a building that clearly exceeds Tacoma's height restrictions? What the frak are spoonhands? I vote for Me... CLOOOOOOONES! by joel413 on 9/26/2008 @ 2:28pm @Erik I'm the unknown artist & all your missing is the Frost Park header from the top of the hill, which was also mine, but nothing fancy. by Erik on 9/26/2008 @ 2:33pm Thanks Joel. Fixed it. 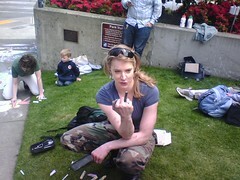 by joel413 on 9/26/2008 @ 3:55pm Aditional note on mine: Above the zoom out is the caption: RxR's Army! by KevinFreitas on 9/26/2008 @ 4:02pm Nice to have Stowe back this week and I love his chalked triumphant return. Great work by Elliot and now I totally want a frisbee with LEDs to make it glow like that. Joel totally rocked it with a great vision of our RR infused clone war future. It's between RR and Andrea for me this week. Though I love the topical message of RR's work I gotta vote for Andrea just because the scene is just a really solid one. See everyone next week! by beerandhotdogs on 9/26/2008 @ 4:23pm I vote RR. by jamesstoweart on 9/26/2008 @ 4:42pm I must vote for myself... because I am in control of a mighty unstoppable zombie army! My out of town guests all had an excellent time. My adopted city showed excellent hospitality to my oldest and dearest friends. 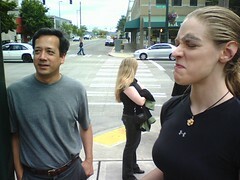 I am very proud of Tacoma and my friends here. Thank you for showing them a good time. And Chris, we hit the Red Hot afterwards. Each and every person named it the bast place they'd eaten during the entire trip. Now to rally them... for a total zombie onslaught! Hope you're all doin' good. I had to spend the day (in between real work) creating my Volcano cover art for Ron. Looks like it will be coming out Oct. 23. My ode to chalk art. Yeah. Here's a surreal scene of Andrea drawing Andrea in the Matador setting. This is the first self portrait I have seen of hers without an anime or fantasy enhancement. I vote for Andrea's piece. 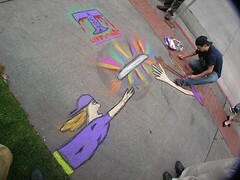 by Derk on 9/26/2008 @ 4:50pm I'm one of the out-of-towners Sto brought to the Chalk Off and had a great time. I must vote for Sto, mainly because of the penguin dressed as a panda shooting a bazooka. How does Stowe do it?! Such complexity in only an hour?! My vote goes to him this week. by Erik on 9/26/2008 @ 5:08pm I must vote for myself... because I am in control of a mighty unstoppable zombie army! Stowe has indeed launched a unabashed zombie army. Yet, I remember the words of Stowe: that there is always a way to kill zombies no matter what the type. by geffen on 9/26/2008 @ 5:56pm Yep. I hate to dogpile it but Stowe did chalk up me a cthuhlu monster on demand! More votes for the Chalking Kong! by geffen on 9/26/2008 @ 6:43pm Hi! This is Monique, another of Stowe's Geek Week crew. I think I'm signed on to the forum as someone else, but I've gotta toss in another vote for Stowe, the Chalking Kong, the penguin in a panda suit, and the many-tentacled Cthulhu. by Erik on 9/26/2008 @ 6:48pm We'll have to crank it up next week and the week after, since the Chalk-Off documentary shows next Sunday. 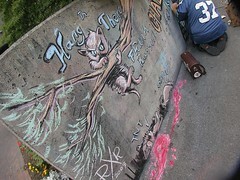 The film briefly examines how Chalk Off got started in Tacoma and why local artists and the community rose to the call to help save Frost Park from being fenced up and closed to the public. Frost Park is named after Tacoma Police officer Larry L. Frost who was tragically killed on duty. by Courtney on 9/26/2008 @ 7:24pm Chalkington! I am so glad our friends had fun even though none of them chalked and darn it all of them are some kind of art major! Andrea's was really solid too and I loved Electric Elliot's piece too. Wish I could have been there. by NineInchNachos on 9/26/2008 @ 7:28pm hi gang. I'm enjoying my RED HOT 6th ave dogs while watching the presidential debates. I vote for Andrea! I love Renaissance art references. Stowe! Welcome back my friend (secret handshake). by NineInchNachos on 9/26/2008 @ 7:40pm Electric Elliot I noticed your use of Elle's paint brush blending method in Kevin's profoundly confident photography stream. Did you find this method superior? by NineInchNachos on 9/26/2008 @ 7:44pm looking forward to Lance's volcano cover!!!!! by NineInchNachos on 9/26/2008 @ 7:51pm dave L, yeah our numbers suffered when the children had to return to school. Kids, forget school. 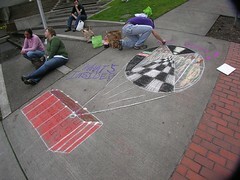 come to the chalk and get a real world education! by deeble interactive on 9/26/2008 @ 8:35pm christ in a dumptruck those were lame debates RR. how could you stand it? by TacomaGnome on 9/26/2008 @ 9:01pm As an outsider who enjoys carving spoons, I certainly cast my vote for Adam. by ALT on 9/26/2008 @ 9:06pm Got a few photos in at the last minute. While I was at it I added a title to my piece. Broke my piece down into several photos given its length. by Nathe on 9/26/2008 @ 9:13pm Adam FTW! Oh, and Adam that can be the alternative meaning I presented to you. But the whole world? Sure. by ALT on 9/26/2008 @ 9:15pm While I'm online I'm going to cast my vote. I vote for myself. It's been a while since I personally felt I created a strong entry, and I really like the way this one turned out. by Elisabeth on 9/26/2008 @ 9:19pm Gun shy. If I stray off topic will you delete me? by aylalala on 9/26/2008 @ 9:23pm Wow. I vote for Andrea. by anubismp on 9/26/2008 @ 9:24pm I vote for Andreas "Premonition". Great work everyone though. by liquid snake on 9/26/2008 @ 9:51pm I vote for Andrea because her artwork is fabulous. by Adam the Alien on 9/26/2008 @ 9:56pm The scary thing is, Andrea's drawing may end up pretty accurate. by Mark Monlux on 9/26/2008 @ 10:00pm I vote for Adam because....SPOON! by tacomachickadee on 9/26/2008 @ 10:35pm I vote for Adam the Alien! So does Little Chickadee/Diva Girl ... she says "it's funny." So that's TWO votes for Adam. by Adam the Alien on 9/27/2008 @ 12:10am Final Count! I was too late to vote but I would have voted for your piece. I haven't voted for a few weeks but your entry was really amazing - the "Last Supper" theme was really impressive and well executed (no pun intended).It was really different from anything you've done before, but your voice was still obvious in the characterization. You never cease to amaze me, woman! by joel413 on 9/27/2008 @ 8:45am You know, maybe this is why RR looks so put out in Andrea's piece! Because the chalk RR knew he wasn't going to get to go! by NineInchNachos on 9/27/2008 @ 12:05pm chalk RR as rendered by Andrea is obviously the 'Judas' of the group. I'm still exploring the symbolism of the bowl(s) of Doritos. Adam will you be filming the power lunch? Please? by Erik on 9/27/2008 @ 12:19pm Congrats Andrea! Andrea has had a bit of a dry spell at Frost and has not prevailed since Episode 12.
by Erik on 9/27/2008 @ 12:25pm chalk RR as rendered by Andrea is obviously the 'Judas' of the group. Yeah. Andrea drew the RR figure on the outside of the group which indicates she had a premonition he would be the last of the three. RR's arms folded with Stowe's back to RR makes his presence even more marginal. Judas is wearing green and blue and is in shadow, looking rather withdrawn and taken aback by the sudden revelation of his plan. He is clutching a small bag, perhaps signifying the silver given to him as payment to betray Jesus, or perhaps a reference to his role within the 12 disciples as treasurer. He is the only person to have his elbow on the table; traditionally a sign of bad manners. Peter looks angry and is holding a knife pointed away from Christ, perhaps foreshadowing his violent reaction in Gethsemane during Jesus' arrest. The youngest apostle, John, appears to swoon. by ALT on 9/27/2008 @ 12:56pm chalk RR as rendered by Andrea is obviously the 'Judas' of the group. As for the corn chips - who's to say? Complimentary Matador hors d'oeuvres or symbolic Nine Inch Nachos? I must say I'm surprised by the results of this Chalk-off! Per usual Stowe and RxR rendered particularly strong entries, and I tried to base my composition on what I had anticipated would be the outcome this week. Of course it, was difficult to guess whose entries would win when they were all still in progress. Adam - congratulations!! Ironic - Julie Bennett had recommended that I draw The Alien at the table, but by then the Chalk-Off was over, and I was just about out of gas. Congrats again, Adam The Alien/The Tick/Spoon Man. I'll see you then and - I supposed I don't need to ask you - bring your camera! by NineInchNachos on 9/27/2008 @ 7:43pm we missed you dawntown! Look forward to your return. I supposed I don't need to ask you - bring your camera! The camera shall be present, and there shall be vlog-tastic goodness. Hopefully in a relatively timely manner, even; I'm catching up in my vlogging - it's mostly slowed, at this point, by some technical problems with some of the footage I imported to a portable drive whilst in Hawaii. All the pieces this week were fantastic...and Andrea, I remain ever-jealous of your art style. This week's piece, in particular, is drawn in that perfect sketchy-but-not-sketchy style I love and wish I could achieve with as much ease as you seem to. Stowe, it was great to see you back...though also intimidating. Perhaps I should take a week off and just watch you for the whole hour, see how you lay down so much friggin' chalk in so little time. Elliot, your very colorful frisbee makes me wonder how your eyes filter reality...perhaps through a combination of science fiction films and a healthy dose of 60's/70's film weirdness? 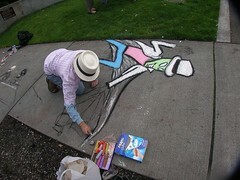 RR, your piece this week - for so many reasons - is one of my favorite Frost Park entries to date. It just worked out perfectly.